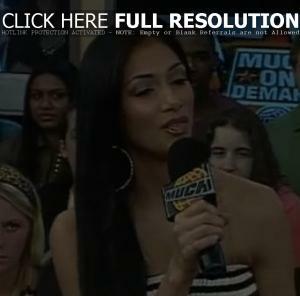 Nicole Scherzinger of the Pussycat Dolls visited ‘MuchOnDemand’ on Monday (April 23) at the Chum/City Building in Toronto, Ontario. The pop star was interviewed about potential sexual harassment at the workplace in the music industry, played a dance move or sexual position quiz and was asked if she had a boyfriend. Asked if she had a boyfriend, Nicole said, “I always say that I’m in a relationship with my music.” When subsequently asked if she watched MTV, Nicole said, “I watch MuchMusic”, knowing that his next question would’ve been about MTV ‘Laguna Beach’ star Talan Torriero, who she’s been lined to. Check out pictures from WireImage. Watch the interview below.